Two kaffiyehs, the traditional Palestinian headscarf, hang in what used to be a bustling marketplace. There is now limited access for tourists, a crucial component of the economy. 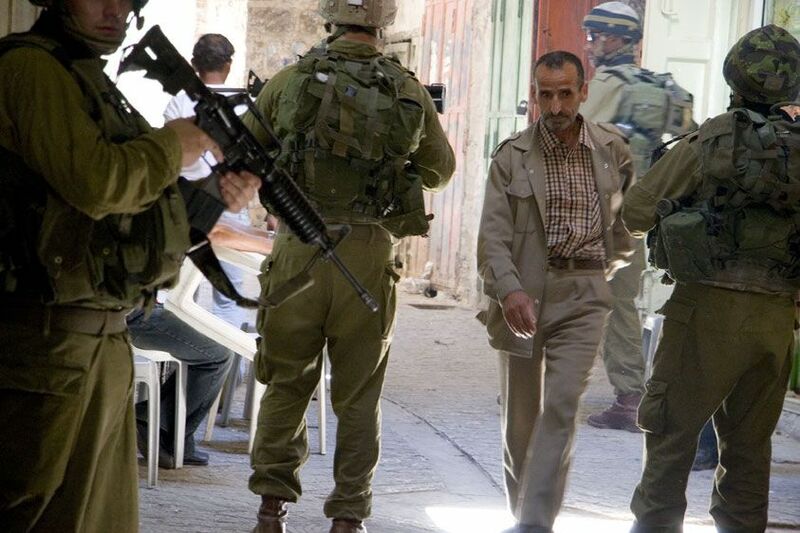 A Palestinian man walks amidst Israeli soldiers as they patrol a Palestinian residential area of Hebron. 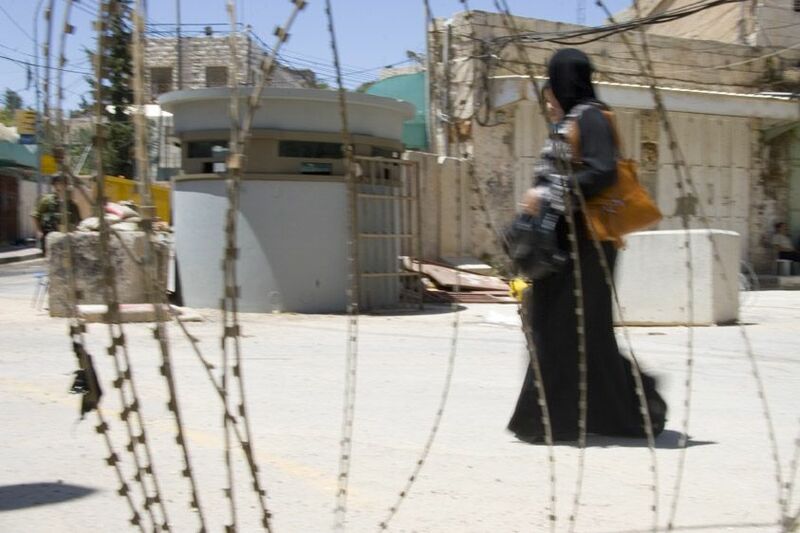 Two Palestinian women pass an Israeli watchtower in the Palestinian corridor of Hebron's Old City. 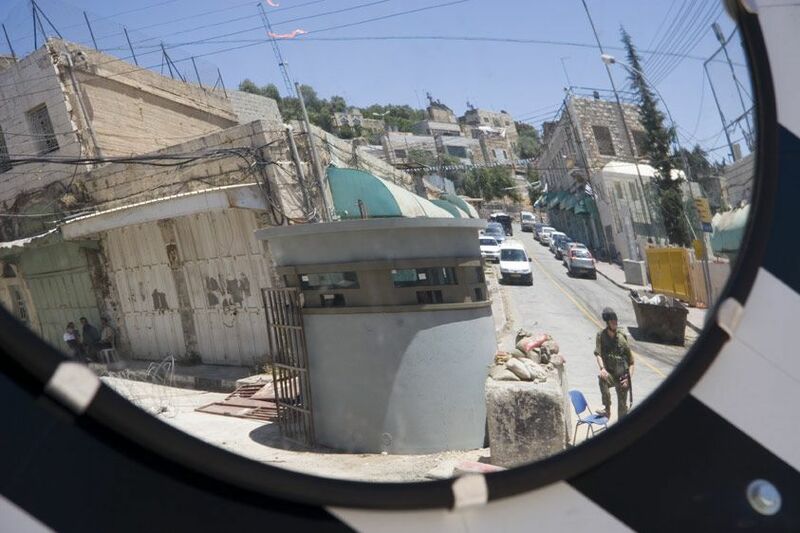 An Israeli watch tower and viewing mirror sit at the junction of two main streets in the main commercial area for the Palestinians. 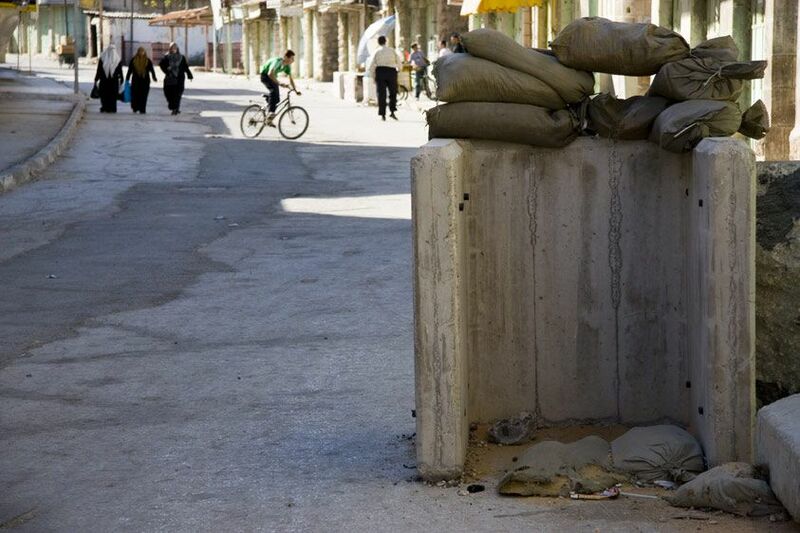 The Israeli military built a station for soldier's protection in the Palestinian corridor of Hebron's Old City. A Palestinian man must show his ID to an Israeli officer so that he may go into the Ibrahimi mosque to pray. The settlers took over homes on the top floors of buildings. They throw garbage, urinate, and worse on the Palestinian streets below. Palestinians created wire canopies to lessen the barrage over the pedestrian area. A mural detail glorifying the settler movement. The settlers maintain the ideology of pioneers and support armed struggle for their cause. The Mosque in Hebron is sacred to both Arabs and Jews, who both recognize it as the birthplace of Abraham. The Israeli military occupies the entrance. Grafitti of a Jewish star on a Palestinian home. A Palestinian woman cleans her entranceway during a curfew necessitating that all Palestinians stay indoors. Two settlers pass an Israeli soldier as they walk through the area of Hebron occupied by 500 settlers. The area is segregated from the Palestinian area. The empty streets reflect the heightened security during which Palestinians are under curfew while the settlers may walk freely outside. 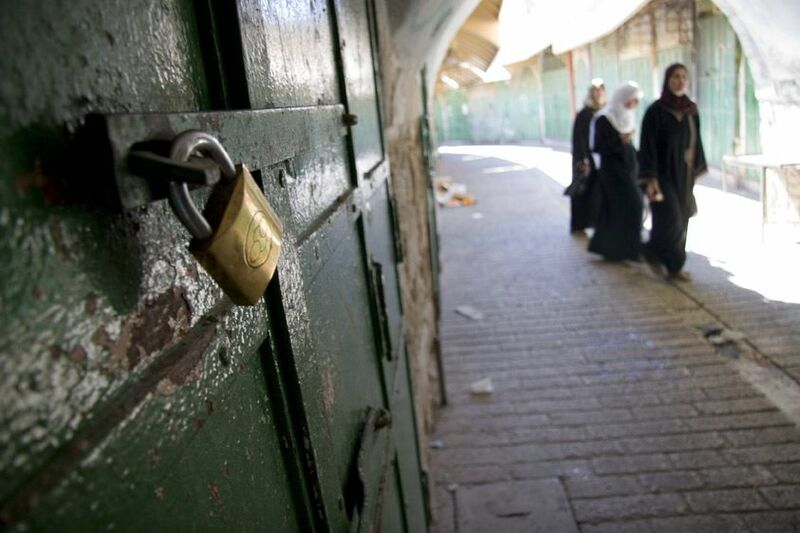 The Old City of Hebron is inhabited by 35,000 Palestinians. 500 Israeli setterls illegally occupy areas, protected by 2,000 Israeli soldiers.